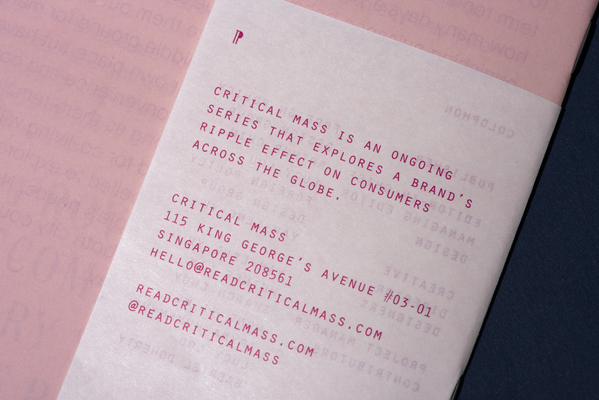 Published by FOREIGN POLICY, Critical Mass is an ongoing series that explores a brand’s ripple effect across the globe — from patterns in consumer spending to environmental affects. Packaged in a handy format, it combines quality cultural writing with intelligent design to showcase how a brand’s living legacies extend beyond mere aesthetics and profit margins, particularly in the ever-changing face of global consumerism. FOREIGN POLICY is a design bureau and think-tank based in Singapore. Story-telling and experience-crafting are at the heart of what we do.